This chess site was created by a chess enthusiast for chess enthusiasts, especially those new to this fascinating game. I hope you will find something of interest and will call again soon. If you would like to link to this site you can find a banner here. Play Internet Correspondence Chess at Chess Corner. Meet and play chess with players from all over the world! The Chess Corner Chess Club contains the most friendly chess players in the world. We play friendly games and also more serious tournament games. It is the ideal place to improve and enjoy your chess. Membership is free. This tutorial teaches the absolute beginner the basic rules of chess and progresses to more intermeditary topics such as tactics, strategy, openings and general playing tips. This is vital reading for anyone wishing to progress in their chess. Who knows? You might just be the next grandmaster with the correct knowledge! Find out about the Chess Champions from Wilhelm Steinitz to Garry Kimovich Kasparov. 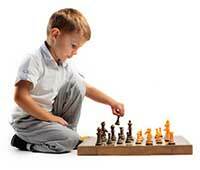 With study and practice maybe you will one day feature in our World Chess Champion Gallery! Ever wondered what the Sicilian Scheveningen Variation, Reti Opening or Ruy Lopez is? Find out what these chess openings are and more. Improve your chess with help from the Grandmasters! Quotes from the world's best chess players! Give yourself a break from all that chess study and have some fun! An interesting collection of games. You may also download games from here. Send a Chess Corner Greeting Card to that special person to let them know you are thinking about them while you are playing chess! Chess Corner is 5 Stars! Chess Corner	was reviewed in the April edition of Web Active Magazine! It was awarded 5 stars and given the Web Active Click It logo! They summed up the site by saying: "Whatever your level of skills, this is an online treat for anyone who is an enthusiast	of the	game." Read the full review here.